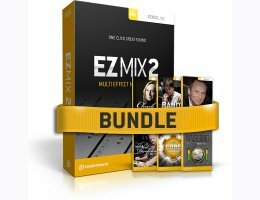 This bundle gives you EZmix 2 with six (6) handpicked EZmix Packs. Combined you get a widely popular and powerful multi-effect mixing tool together with the know-how of some of the world's most renowned producers and mix engineers in one convenient package. Stevie Nicks, The Killers, Fleetwood Mac, Shakira, My Chemical Romance and John Hiatt all call Mark Needham when they need a great mix. Now it's time to fuel your songs with some signature, multi-platinum magic! Your mixes will thank you. "EZmix 2 sounds good enough for real record making on a professional level. It's a great tool because it gives you immediate satisfaction - and it's fun!" says Neil Dorfsman, producer and engineer behind some of the biggest records of all time: Bruce Springsteen's "The River", Sting's "...Nothing Like the Sun" and Dire Straits' "Brothers in Arms". Get some of his magic! Having worked with A-list clients back to back for the past plus 20 years, mixed groundbreaking works like Metallica's "Black Album" and Mötley Crüe's "Dr. Feelgood", shaped the sound for artists like Nickelback, Michael Bublé and Bryan Adams, Randy Staub is beyond just a mix engineer. He's an institution in the music production community and perhaps the most prolific engineer of the last two decades. The mastering pack contains settings for the most common mastering needs and music genres. Whether you are working on a loud rock song, a mellow jazz tune or a big house anthem, this pack will take your mix from great to fantastic in no time.